Shadowhunters is an American supernatural drama television series developed by Ed Decter, loosely based on the popular book series The Mortal Instruments written by Cassandra Clare. It premiered in North America on Freeform on January 12, 2016. Primarily filmed in Toronto, Ontario, Canada, the series follows Clary Fray (Katherine McNamara), who finds out on her birthday that she is not who she thinks she is but rather comes from a long line of Shadowhunters, human-angel hybrids who hunt down demons. It is the second adaptation of the novel series, after the 2013 film The Mortal Instruments: City of Bones, which like the series was produced by Constantin Film. 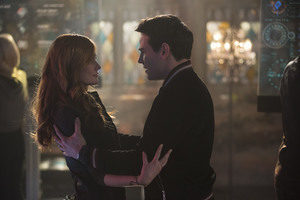 The debut season of Shadowhunters has received mixed responses from critics. The pilot episode attracted the largest audience for Freeform in more than two years. The show has received numerous award nominations, winning one GLAAD Award and two Teen Choice Awards. The series was renewed for a second season of 20 episodes, which premiered on January 2, 2017. In August 2016, showrunner Ed Decter exited the series over “creative differences”. Todd Slavkin and Darren Swimmer were named as Decter’s replacements. On April 21, 2017, Freeform renewed the show for a third season of 20 episodes, which is set to premiere on March 20, 2018.